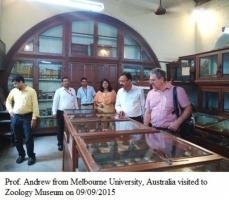 The Department was originally established as Department of Biology in 1905, with an initial grant of Rs.10,000. The Department of Zoology separated from Biology department in 1916, with a donation of Rs.20,000 from H.H. Maharaja of Indore Sawai Tukojirao Holkar. The department has completed 107 years of establishment. First batch of B.Sc. Zoology degree passed out in 1945. It is recognized as research Center by University of Pune on June 15th 1979. The department houses Museum which is one of richest museum across the country. The department was also recognized for DST-FIST support in the year 2007. At present, it has spacious and well equipped laboratories with advance instrumentation for biological studies. The department has major and minor research projects funded by Ministry of Environment and Forests, Government of India, University Grants Commission, and University of Pune. As a recognized research center by University of Pune, the department has research students working for their M.Phil and Ph.D Degrees. The Department has established an Association for students and christened it as “Zooassociation”. Under the Association activities, Eminent Scientists and Academicians are invited as Resource person where they interact with students on various research areas. Apart from this, every year an exhibition is organized where students do small projects, display them and interact with each other. This activity is been continued for past several years. Process of Admission for First and Second Year B.Sc. Commencement of Lectures and practicals of Second Year B.Sc. Commencement of Lectures and practicals of First Year B.Sc. Admissions for Third Year B.Sc. Commencement of Lectures of Third Year B.Sc. Commencement of practicals for Third Year B.Sc. DBT Star Hands-on practicals for S. Y. B. Sc. and T. Y. B. Sc. students. Inaugural Session of “Zoology Association” and a beginning of Guest Lecture Series. Lectures and Practicals of First and Second Year B.Sc. One day excursion for Third Year B.Sc. students. Lectures and practicals of First , Second and Third Year B.Sc. Excursion and Field Visits for First year B.Sc. Students. DBT Star Hands-on practicals for S. Y. B. Sc. students. Lectures and Practicals and Sem. Examination. Field Visits for Second Year B.Sc. Students. Teachers’ Training Program for School teachers under DBT Star Scheme. Lectures and Practicals of First, Second and Third Year B.Sc. Institute Visits for Second Year B.Sc. Students. Guest Lecture of Zoology Association. DBT Star Hands-on practicals for F. Y. B. Sc. students. Long Excursion for T. Y. B Sc. students. Institute visit third year B.Sc. Practical Revision Display. 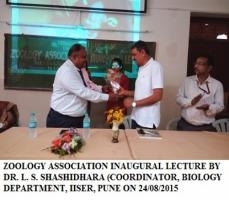 Zoology association Inaugural Lecture by L.S.Shashidhara. Ecological study and faunastic survey of bats in Pune corporation limits. Ecological study and faunastic survey of bats from Pune District. Phylogeny of Horseshoe and Leaf-nosed bats from Pune District inferred from morphometrics and mitochondrial DNA sequences. Assessment of bat diversity from Central Western Ghats of Maharashtra. Study of Limnological Parameters of Khadakwasala reservoir as conservation site for threatened fish Mahseer. Study on diversity and distribution of Beetles (Insecta: Coleoptera) in Western Ghats of Pune district.